The Hub Free books! 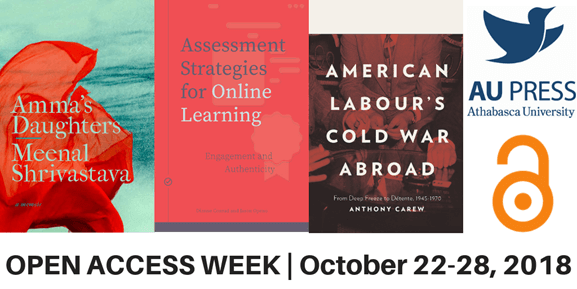 Happy Open Access Week! Home / Free books! Happy Open Access Week! Free books! Happy Open Access Week! Did you know that you can download AU Press publications for FREE from the AU Press website? In fact, everyone can! That’s because AU Press is an open access press and their mandate is to reduce barriers to knowledge and increase access to scholarship. Check out some of these amazing new reads from AU Press. In this volume, practitioners will find not only an indispensable introduction to new forms of assessment but also a number of best practices as described by experienced educators. In this comprehensive account of how the AFL-CIO became embroiled in CIA activities, Carew brings to light the trade union’s role in producing anti-communist propaganda and their participation in intelligence gathering in Eastern Europe from 1945–1970. This richly detailed re-memory uncovers the history of the female foot soldiers of Gandhi’s national movement. Using her grandmother’s 1962 autobiography as a foundation, Shrivastava reclaims an important part of India’s history and gives voice and honour to the thousands of largely forgotten or unacknowledged women who relentlessly and selflessly gave toward the revolution.